Patio Place provides Westminster with the best deals on brand name patio furniture, barbecues, fire pits, umbrellas, gas logs, bar stools, and more. In business for over 25 years, our family-owned business has helped thousands of homeowners and business owners furnish their outdoor spaces, from small bistro areas to expansive backyards to resort poolsides. Throughout the years we have developed the experience, knowledge, and expertise necessary to ensure that our valued Westminster customers go home happy. We always take the time to listen to and answer customer questions, and address any space, decor, or budget concerns they may have. We also perform low-cost, expert repair services. Our repairs include custom-making replacement outdoor cushions and pillows, restringing and recovering umbrellas, replacing umbrella ribs, replacing common barbecue parts, and refinishing outdoor furniture frames. We further specialize in custom-fabricating covers that will protect your investments from rain, fading, and other damage. With unparalleled customer service, convenient same-day delivery, and the best prices in Orange County, we offer an unbeatable value for everything we sell. Patio Place is open seven days a week and located in Costa Mesa (at 845 Baker Street). We invite you to call or visit us today. These outdoor living pieces will beautifully furnish any home or business in Westminster and look great for many years. Call today to speak with one of our knowledgeable employees. 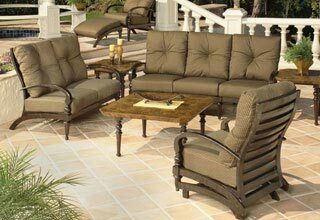 As authorized dealers for some for some of the biggest patio furniture brands around today, our team members are thoroughly trained and capable of providing professional advice and trustworthy recommendations. As a family-owned business, we go above and beyond to ensure that our Westminster customers receive an incredible value on quality patio furniture from the industry's leading brands, such as Sunset West, Patio Renaissance, Alumont, Telescope, Gensun, and others. Whether you're looking for patio furniture in wicker, extruded aluminum, or cast aluminum styles, we can help. We will happily mix and match existing patio furniture frames with standard or custom-made outdoor cushions, special order patio furniture not in our stock, and custom order specially made outdoor furniture to your exact specifications--all for surprisingly affordable prices. And, for large purchases, we can visit your Westminster site and assess your decor, listen to your goals, bring prototypes, discuss samples, and address any budget concerns. Call today to learn more about our gorgeous selection of patio furniture for Westminster. Patio Place offers a full range of patio furniture restoration services to Westminster customers. From thoroughly cleaning patio chairs to restoring teak tables to like-new condition, we do it all. We will revitalize your aged patio furniture frames using a special, liquid treatment, and custom-make replacement outdoor pillows, cushions, slings, and straps, all for the best prices in Westminster. 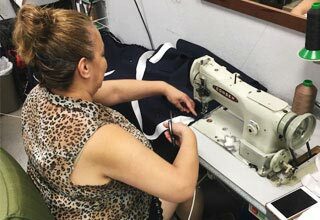 We use the industry's best fabrics and can enhance patio chair slings with extra padding and add zippers to cushions (so they're easier to clean). 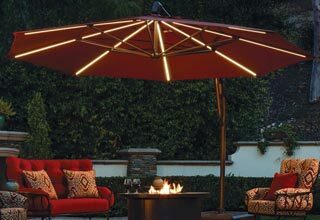 We also stock more than 600 Sunbrella and other leading outdoor fabrics for you to choose from. Call and learn more today. We've helped thousands of Westminster and Orange County customers find quality, brand patio umbrellas in the exact style, size, and design they need. We sell and deliver cantilever umbrellas, auto-tilt umbrellas, side-post umbrellas, table umbrellas, lighted umbrellas, and more, all of which are designed to withstand the elements. We can also customize umbrellas to suit your tastes by recovering them in your choice of fabric, adding lights, or finding you a specific base. Visit us today to view our extensive collection of Galtech, NorthCape, Treasure Island and other brand name patio umbrellas for Westminster. For old, faded, or damaged patio umbrellas in Westminster, we offer our expert recovering, restringing, and rib replacement services. All of these services are affordably priced and completed in a timely manner without sacrificing quality. Additionally, our skilled professionals provide silkscreening for commercial clients in Westminster who wish to personalize their umbrellas with a company's name or logo. For all of our custom replacement cushions and pillows, umbrella recovers, and protective covers, we use only the finest outdoor fabrics on the market. Westminster clients can choose from Sunbrella, Phifer, and original manufacturer fabrics, all of which are stylish, durable, and typically warrantied for years against fading and damage. We have more than 600 fabric options, which means that you are sure to find the style and price that meets your needs. Call today to learn more. Visit us today for the best prices on brand name fire pits, fire tables, and bar stools. Durable, easy to operate, and available in countless designs, shapes, and sizes, our fire pits and fire tables are sure to complement any home or business decor in Westminster. 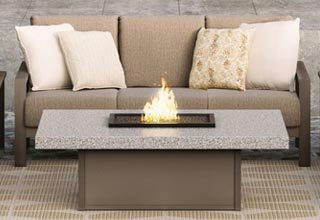 We stock a wide selection of fire pits from Hanamint, Alumont, and other trusted brands, and can also custom-make fire tables in granite, travertine, and other materials. These fire pits and fire tables are usually purchased with bar stools to create a warm and inviting space to socialize. Our bar stools come from top brands and are available in a variety of styles. Pick up the phone and ask our knowledgeable sales team about our brand name gas logs and barbecues from Fire Magic, Real Fyre, R.H. Peterson, and other leading brands. We sell the finest barbecues and outdoor cooking equipment on the market as well as accessories and parts. Come visit us today to look at our selection of BBQ grills, range hoods, access doors, drawers, lights, fridges, sinks, faucets, kegerators, and more. We can also come to your Westminster home or business to install common replacement barbecue parts or to convert your barbecue from propane to gas (or gas to propane). Our ceramic gas logs also meet with the highest of industry standards and are available in attractive charred American oak and other designs. Choose from vented or unvented gas log models. We also sell river rocks, fire glass, lava rocks, and other fireplace and fire pit accessories.